Find out more about our work in the Middle East by visiting our interactive map. The American people, through USAID, support the people of the Middle East and North Africa as they strive for peace and prosperity. USAID responds to needs in the region by promoting inclusive economic growth, improving education and healthcare, supporting local democratic processes, strengthening civil society and addressing cross-border issues including water scarcity and the regional impact of conflict. Insufficient economic growth and high unemployment among youth remain major challenges throughout the Middle East and North Africa. Education systems and skills training often fail to prepare young people for the workforce. USAID works with local partners and the private sector to promote inclusive economic growth. Strengthening basic and higher education, keeping young people in school and reducing dropout rates, with an emphasis on developing reading, science, and math skills. Providing job training and workforce skills development, preparing the region’s young people for employment. Working directly with farmers and businesses to share best practices and technical advancements. Offering small- and medium-sized enterprises start-up capital, training, mentorship, entrepreneurship skills, and regional networking opportunities for sustainable economic growth and job creation. For the region to truly be stable and prosperous, citizens’ demands for inclusive, responsive governance must be addressed. USAID is committed to helping build resilient, democratic societies by working with local partners to improve transparency and accountability of governments, and support expanding participation by civil society, youth, minorities and women. USAID supports the development of government institutions, including promoting the rule of law, increasing civic engagement, and enhancing respect for human rights. Increasing minority, youth and women’s participation in the political process. Engaging civil society to advocate for transparency and accountability of governments. Supporting government-led reforms to foster more pluralistic, fair, responsive, and representative political leadership, and greater competition. The region contains 12 of the world’s 15 most water-scarce countries. USAID works with the public and private sectors to develop and implement new “water-smart” technologies, and seeks opportunities to improve sustainable access to water for 20 million people in the region. Programs target local and cross-border issues that hinder efficient and equitable management of water resources, as well as public education campaigns encouraging citizens to be responsible stewards of limited water supplies. Expanding access to clean water and sanitation to promote better hygiene and fight preventable disease, especially within vulnerable communities. Rehabilitating urban water infrastructure to serve expanded populations. Increasing water productivity in agriculture and industry to boost output while conserving a precious resource. Improving water resource management, public acceptance of conservation, and reforming governance and regulations to equitably share access and defuse competition. In Egypt, nearly 1.5 million girls improved their reading and comprehension skills through an early-grade reading program. USAID programs have enabled the expansion of and provided reliable access to potable water for more than 1.5 million Lebanese through enhanced efficiency and sustainability of the public water utilities; water supply efficiency improved by around 30%. Palestinian farmers increased exports by $23 million last year by improving standards and encouraging cooperation and innovation for economic benefits and global competitiveness. USAID’s introduction of solar technology submersible pumps enabled approximately 120 orchards in Northwest Syria to be irrigated. The crises in Syria, Iraq and Yemen are a regional challenge of unparalleled magnitude. USAID responds with assistance to foster resilience and stability. We work closely on crisis response with USAID's Office of Foreign Disaster Assistance, which directs the Agency's humanitarian assistance programs. More than 6.5 million people are displaced inside Syria, with more than 3.9 million refugees. The majority of Syrian refugees are living within communities in Jordan and Lebanon, doubling and tripling the size of towns already struggling to provide essential. 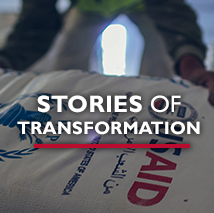 USAID has re-oriented existing programs to account for the refugee situation and added funds to help host communities by building more schools, renovating and expanding health facilities, and increasing access to water. Within Iraq, 2.8 million are displaced. Existing development assistance programs support Iraqi government institutions and civil society to improve the delivery of essential services, provide free legal assistance to displaced and vulnerable Iraqis, provide short-term job opportunities to the displaced, and assess protection concerns of vulnerable populations. In Yemen, over half a million people have been displaced which has exacerbated an already dire humanitarian situation. As conditions permit, USAID is prepared to support a political transition and peace-building processes as they emerge.